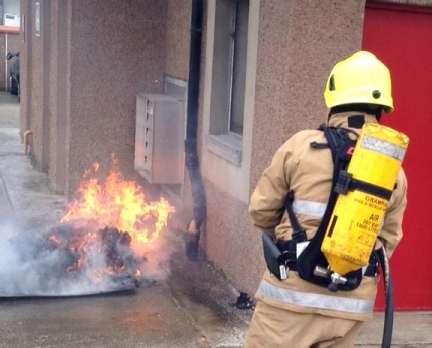 Did you know that in Peterhead and Fraserburgh alone, the Scottish Fire and Rescue Service deals with over a hundred deliberately started fires every year, which not only puts people's lives at risk, but also damages property and the environment? Statistics from the Scottish Fire & Rescue Service show that in 2012/13 there were 7,937 fires involving refuse and flytipping almost 90% of which were started deliberately. Together, we can prevent these mindless acts, by ensuring we dispose of rubbish safely, keep communal areas in flats secure and only put our wheelie bins out on collection day. As taxpayers we all bear the brunt of the cost, but there is something we can do about it. Many of these fires are set in wheelie bins, which have the potential to put homes, vehicles and the public at risk. The launch was to raise public awareness of the dangers and consequences of setting fires. As a community we can make a difference by educating our kids about the hazards and dangers of fire. By working as a team alongside your friends at the Scottish Fire and Rescue Service you can help keep make communities safer by reducing the threat of deliberate fire raising.